Creamy Chicken Enchiladas are pure comfort! 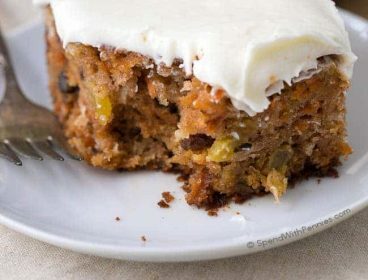 There are a few steps to prepare these but I can assure you, it’s worth every second! 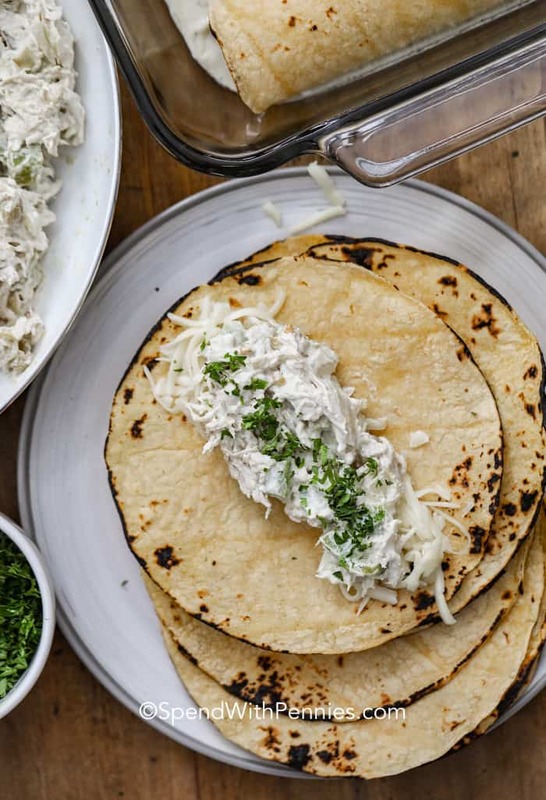 A creamy shredded chicken filling is combined with cheese and a sour cream green chile sauce. 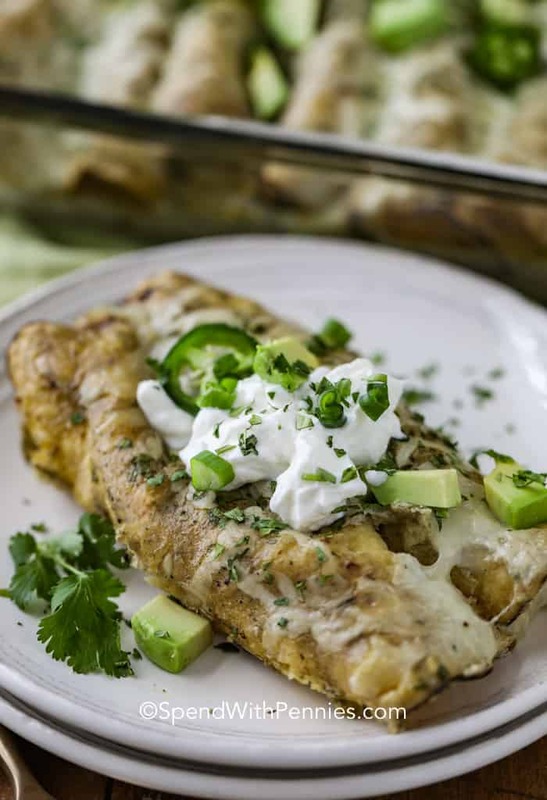 Everything is rolled up into corn tortillas, topped with more cheese and baked until bubbly! 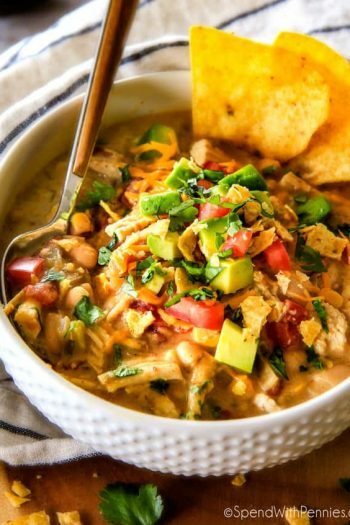 Serve with a side of Mexican Rice or Frito Corn Salad! This simply delicious Green Chile Chicken Enchilada Recipe is one cheesy, creamy, and absolutely satisfying family favorite in my house. These are easy to make and are quite literally my favorite meal (along with Homemade Mac and Cheese of course)! 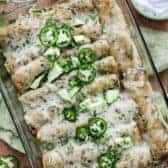 SAUCE: This meal is also known as white chicken enchiladas or green chile enchiladas because it uses tortillas, shredded chicken breasts and a sour cream enchilada sauce with green enchilada sauce (instead of a traditional red enchilada sauce). TORTILLAS: Traditional chicken enchiladas are made with corn tortillas however if you prefer flour tortillas, you can certainly use those! To avoid having them crack when rolling them, heat your corn tortillas. I like to place them directly on a low flame on my gas stove to char the edges a bit and add great flavor! 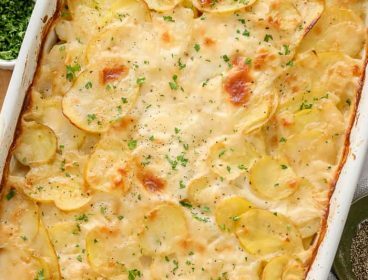 CHEESE: The addition of cream cheese and Monterey jack make these extra creamy. 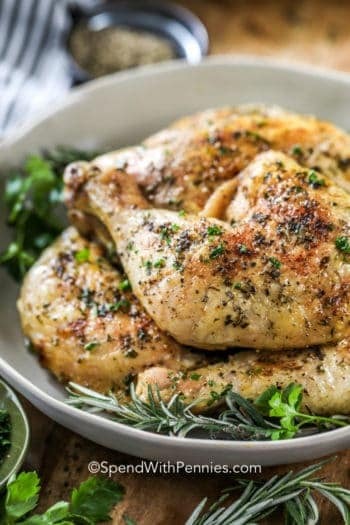 CHICKEN: You can use rotisserie chicken, baked chicken breasts, or poached chicken to make this recipe. 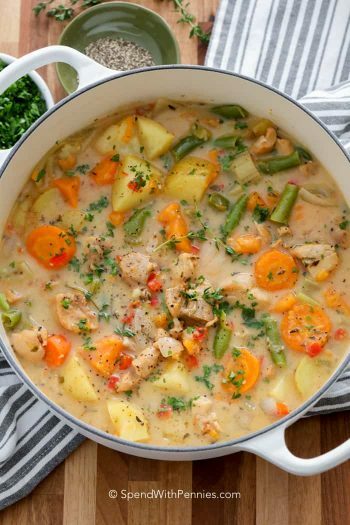 If you have leftover chicken to use up, that works too! Shredded chicken makes the best chicken enchiladas, so start with chicken breasts or thighs (boneless or bone-in will work). 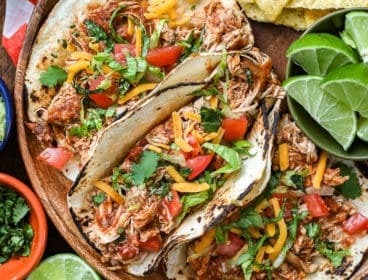 I often cook big batches of CrockPot Shredded Chicken to keep in the freezer for recipes just like this! Bone in chicken has great flavor and you can use the bones for a chicken stock after too! Preheat oven to 350°F. Lightly grease with olive oil. 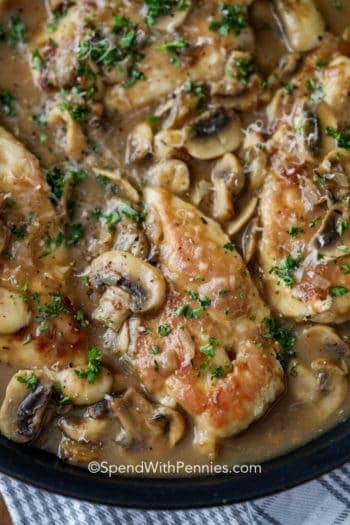 Place bone-in chicken breasts, thighs or both in the pan. Brush with oil and sprinkle with salt and pepper (and a bit of Homemade Taco Seasoning). Cover the pan with foil and bake for 45-55 minutes (depending on the size of the chicken) or until it reaches 165°F. Remove from the oven and shred using two forks. 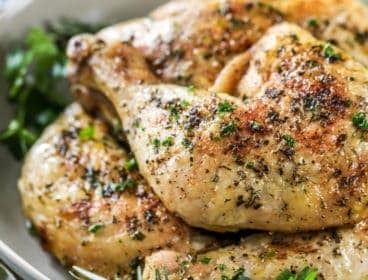 Here’s another option: make boiled chicken! 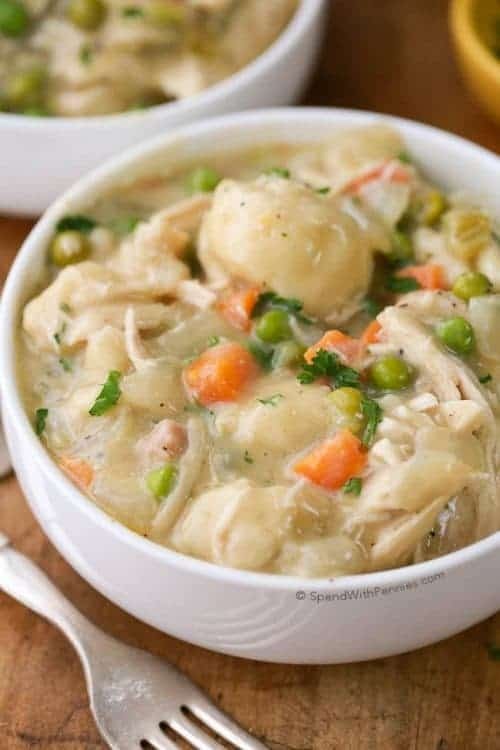 While ‘boiled chicken’ doesn’t sound like much, the meat comes out incredibly tender and flavorful plus you end up with an amazing pot of chicken broth great for Slow Cooker Chicken Enchilada Soup! A lot of authentic Mexican kitchens prepare chicken for enchiladas this way. Beef Enchilada Casserole – family favorite! Make Sauce: Combine sour cream & green enchilada sauce. Make Filling: Saute the onion, garlic and poblano pepper until softened. Stir in the shredded chicken, cream cheese & canned green chilis. Fill Tortillas: Briefly heat the tortillas, either in a non-stick pan, over a gas flame or in the oven (this keeps them from cracking). Fill and roll. Bake: Top with remaining sauce and cheese, and bake uncovered. These Creamy Chicken Enchiladas are also great made into a chicken enchilada casserole in the oven. Layer the ingredients instead of baking and cook uncovered for an hour, at 350°F. Enjoy! 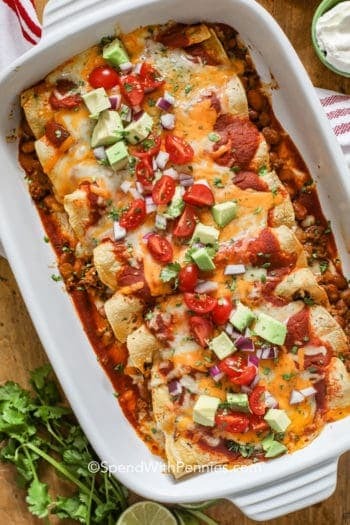 Can You Freeze Chicken Enchiladas? Sure you can! 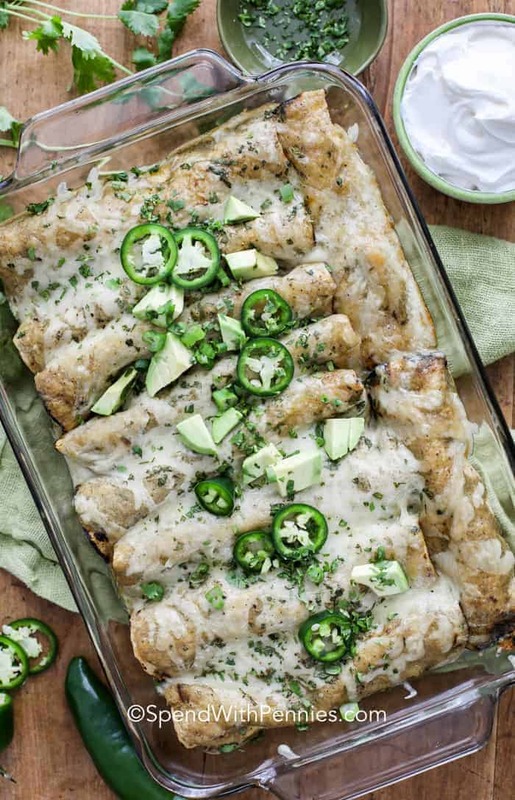 These Chicken Enchiladas can be made ahead frozen for another day! I find the best method is to prepare and roll as directed with the exception of the sour cream sauce. Place the green enchilada sauce in a separate container and add sour cream once defrosted (the little bit in the filling will be fine). Defrost both in the refrigerator overnight. To bake, combine the sour cream with the enchilada sauce. Pour over the enchiladas and bake as directed. This easy chicken enchilada recipe is one cheesy, creamy, utterly satisfying family favorite in my house. Cook onions, peppers and garlic in butter until softened. Add cream cheese, green chiles, and cumin. Stir until melted. Stir in chicken and 1/4 cup sour cream & 1/4 cup enchilada sauce. Combine remaining 1/2 cup sour cream with enchilada sauce. Spread 1/2 cup of sauce mixture in the bottom of a 9x13 pan. Gently heat or fry tortillas (I heat mine over the gas stove to add a smoky flavor). Add 2 tablespoons cheese to each tortilla. Top with 3 tablespoons chicken mixture and a small sprinkle of cilantro. Roll and place seam side down in the pan. Repeat with remaining tortillas. Top with remaining enchilada sauce and cheese. Bake 20-25 minutes uncovered. Rest 10 minutes before serving. 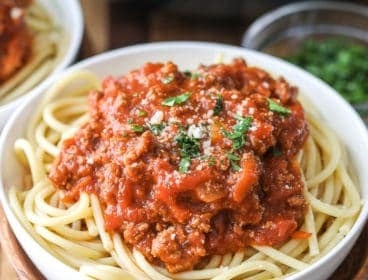 Would like to sign up for daily recipes. Thanks! 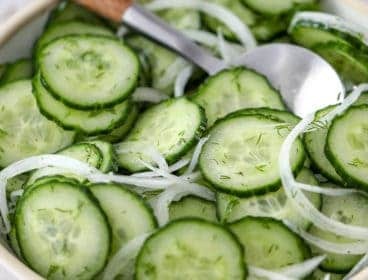 We all enjoyed the enchiladas; but, I was wondering if you had any recipes for making a green chilli sauce instead of using the premade enchilada sauce?? I love the chicken to try myself.